A high-volume, portable solution for purifying lots of water. Great for remote locations, extended basecamp living or emergency situations. The system electrolyzes brine solution (mixed by you) into chlorine, and in one 5-minute cycle, produces enough to treat 200L of water. It needs a 12-volt battery (not included) as a power source. Adapters for vehicle and wall outlet are available separately. Generates enough chlorine solution to treat 200L of water in one 5-minute cycle. Default power source is a 12-volt battery (connected via included alligator clips). One fully charged 12-volt battery provides enough power to treat 40,000L of water. Can also be powered by car and wall outlets using adapter kits (sold separately). Easy to follow 1-page image-only instructions. White indicator light and sound signals communicate the progress of electrolysis. Coloured lights indicate power source or brine concentration issues. Includes measuring cup (for treating 200L barrels) and measuring spoon (for treating 20L cans). 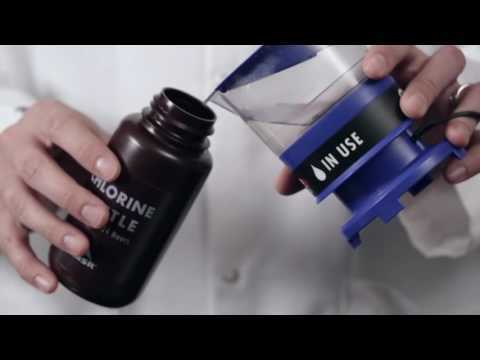 Chlorine container (included) to store treatment solution for up to 24 hours, to treat water that's remote from the chlorine maker and its power source. Tested and validated in low-resource settings, including communities in Kenya, Mali, Tanzania, Zimbabwe, and Thailand.